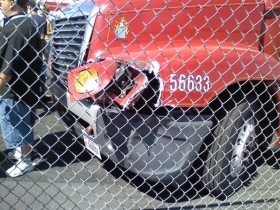 There was an accident at the truck driving school today! Oh, I can't believe my husband's been gone less than a week, it feels like a month! Usually time goes by so quickly but now it's just dragging, even though I've been ridiculously busy. It makes me sad when I talk to him lately, he's not himself at all. He seems disinterested in what I say sometimes, he's always preoccupied and distracted. I suppose he's just focused like a laser-beam on the intense CDL training. I know he has to be, or he'd be lost. And he did apologize for being so hyper and cutting some of our calls short, and I understand. But I also miss him terribly (the "regular" him) and I'll be glad when the trucking school part of this is over with. He only called me twice today. He was going to call again but, when I called him, he said he forgot! How could he forget? Talking to him is the highlight of my day and I sit on the edge of my seat waiting for my phone to ring (actually, it plays a Black Sabbath song). I also got upset when he said it felt like he was partly on vacation...nice. That annoys me because I NEED a vacation. Made me feel like shopping (but I fought that urge and did not). On the other hand, he did say that his room feels like a modified jail cell, complete with steel beds. I'm glad he's suffering. ;) Just kidding. - He never did get a tour of the place, and is still discovering new stuff in bldg. He missed his first business call at home today, but it was only a small job we lost. - Between 1/3 to 1/2 of his original CDL class are gone, with more leaving every day (he lost track). But I found out something very interesting: He was told that they do not charge you any tuition if you drop out or are sent packing during the school part of this, only once you get a CDL and go out with the trainer. I hope that's true, it only seems fair. - He was offered a flexible, accelerated program, for those who already have some truck driving experience, and he could have gone out with a trainer already today. But he decided that he wants to stay with the "regular" class, and learn as much as he can at a slower pace, even though he said he's bored some of the time. - They take practice CDL tests every day, they are still practicing backing and pre-trip inspections, and will do more backing and parallel parking tomorrow. - The very few who are still failing their CDL permit tests are being held back for more training, and will be delayed a week behind everyone else (but at least they didn't send them home). - Some of his school mates are a draftsman from California, an EMT from New Mexico, and someone all the way from Hawaii. A department of the federal executive branch responsible for the national highways and for railroad and airline safety. It also manages Amtrak, the national railroad system, and the Coast Guard. State and Federal DOT Officers are responsible for commercial vehicle enforcement. "The truck police" you could call them. Truck drivers who regularly pick up from or deliver to the shipping ports will often be required to carry a TWIC card. Your TWIC is a tamper-resistant biometric card which acts as both your identification in secure areas, as well as an indicator of you having passed the necessary security clearance. TWIC cards are valid for five years. The issuance of TWIC cards is overseen by the Transportation Security Administration and the Department of Homeland Security. Nearly a week into CDL training and more students are dropping out of the class. It's a fast-paced truck driving school and not everyone will make it. Truck driver training is always filled with a lot of pressure and uncertainty. That is what has made his accomplishments so special. Almost three weeks into truck driving school and this CDL training is high pressure and intense. It's difficult, and there's a lot to deal with. This is what I've learned from the perspective I've gained as my husband went through the classroom training in truck driving school. I've just completed my first week of truck driving school and what a week it has been! We covered backing, pre-trips, got our CDL permit, and more!